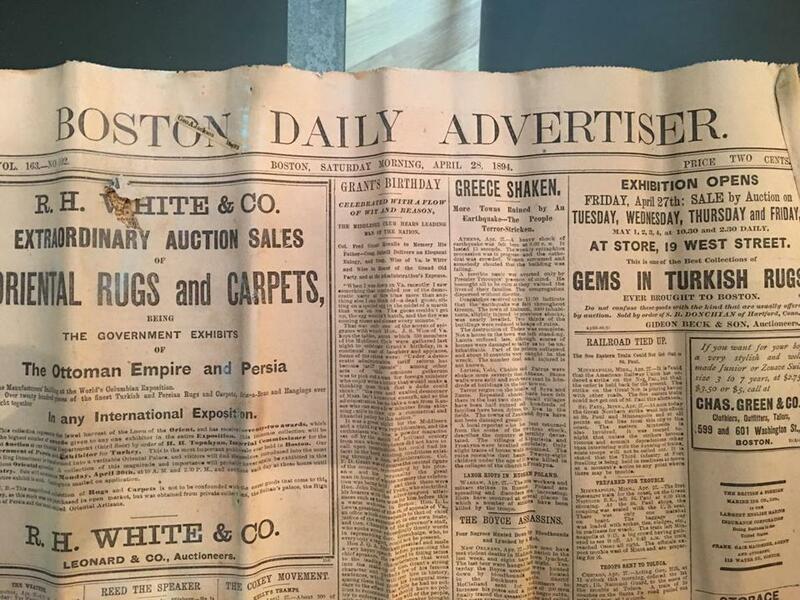 A Boston Daily Advertiser newspaper, dated April 28, 1894, was one of many artifacts in a time capsule discovered by construction crews at an old school in Swampscott. In 1894, a new Romanesque-style high school was built atop the highest hill in Swampscott, with a prime view of the ocean. Townspeople felt immense pride over the construction of their first school, built 42 years after the community split from its neighbor, Lynn. This week, a construction crews tearing down that building recovered a 124-year-old time capsule hidden underneath a granite staircase. • A Boston Daily Advertiser newspaper dated April 24, 1894, the day the building was dedicated. • A Lynn Daily Item dated March 1894. • Remnants of a military wormer, used to clean gun powder out of a musket, in paper roll with an inscription used in the Civil War, presumably owned by local veterans in their fifties at the time. • A hat band from military uniform, believed to be from the Civil War. • An address read at the school dedication. • One Grand Army of the Revolution medal with a ribbon. • A bundle of news clippings and notes. • A list of soldiers who served in the Civil War. • Botany drawings from students. • Four town annual reports. Time capsule discovered by a construction crew in Swampscott. Growing up in the town, Ippolito had heard anecdotes about the existence of a time capsule. But she never thought the crews tearing down her high school, a building she had always admired, would find anything. The 105,000-square-foot school was built at a time when burying a time capsule beneath a large public project was commonplace. The brick building featured towers with granite stairs leading up to the main entrances. When breaking up the staircase, a construction worker noticed the bottom of one piece of granite had been hollowed out and recovered the box. Sitting atop Greenwood Avenue, the Phillips School served as both a middle school and a high school at different times. The building underwent minor alterations in 1915 and major renovations in 1936. The final addition to the building was made in 1969 and the school shut its doors in 2006. The building remained empty for years until Groom Construction submitted plans for a new condominium development last year, and crews began hacking away at the old building in May. When crews turned the capsule over to Ippolito, she couldn’t make out any writing because the box was packed so tightly. She brought the time capsule to the Northeast Document Conservation Center in Andover, where archivists will preserve its contents. Michael Lee, director of paper and photograph conservation at the center, said this is the second time capsule they have received in the past four to five years. The center will treat the paper to make it easier to display. The town hopes to exhibit the items in protective sleeves at town hall and digitally archive the artifacts so residents can view the objects without damaging them. And the quest for buried history isn’t over in Swampscott. In 1936, the town remodeled the building to emulate a neoclassical style, and residents believe another time capsule was buried. Allison Hagan can be reached at allison.hagan@globe.com. Follow her on Twitter @allisonhxgan.